Is a Balloon Based Internet Service a Threat to Traditional Cable and DSL? I recently read an article regarding Google’s foray into balloon based Internet services. This intriguing idea sparked a discussion with some of the engineers at a major satellite internet provider on the same subject. They, as well as myself, were somewhat skeptical at the feasibility of this balloon idea. Could we be wrong? Obviously, there are some unconventional obstacles with bouncing Internet signals off balloons, but what if those obstacles could be economically overcome? First lets look at the practicalities of using balloons to beam Internet signals from ground based stations to consumers. Satellite Internet, the kind used by Wild Blue, usually comes with a minimum of a 1 second delay, sometimes more. The bulk of this signal delay is due to the distance required for a stationary satellite, 22,000 miles. A balloon would be located much closer to the earth, in the atmosphere at around 2 to 12 miles up. The delay at this distance latency is just a few milliseconds. Getting a basic stationary satellite into space runs at a minimum 50 million dollars, and perhaps a bit less for a low orbiting non stationary satellite. Balloons are relatively inexpensive compared to a satellite. Although I don’t have exact numbers on a balloon, the launch cost is practically zero, a balloon carries its payload without any additional energy or infrastructure, the only real cost is the balloon, the payload, and ground based stations. For comparison purposes let’s go with 50,000 per balloon. Both options can use solar, orienting a balloon position with solar collectors might require 360 degree coverage; however as we will see a balloon can be tethered and periodically raised and lowered, in which case power can be ground based rechargeable. This is the elephant in the room. The position of a satellite in time is extremely predictable. Even for satellites that are not stationery, they can be relied on to be where they are supposed to be at any given time. This makes coverage planning deterministic. Balloons on the other hand, unless tethered will wonder with very little future predictability. A balloon at 10,000 feet can cover a Radius on the ground of about 70 miles. A stationary satellite can cover an entire continent. So you would need a series of balloons to cover an area reliably. I have to throw out the idea of untethered high altitude balloons. They would wander all over the world , and crash back to earth in random places. 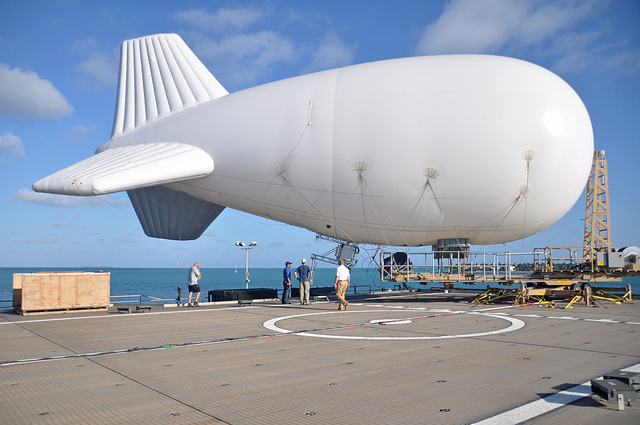 Even if it was cost-effective to saturate the upper atmosphere with them, and pick them out when in range for communications, I just don’t think NASA would be too excited to have 1000’s of these large balloons in unpredictable drift patterns . So far I have been running under the assumption that the balloon based Internet service was an alternative to satellite coverage which finds its niche exclusively in rural areas of the world. When I think of the monopoly and cost advantage existing carriers have in urban areas, a wireless service with beamed high speeds from overhead might have some staying power. Certainly there could be some overlap with rural users and thus the economics of deployment become more cost-effective. The more subscribers the better. But I do not see urban coverage as a driving business factor. Would the consumer need a directional Antenna? My conclusion is that somebody, like Google, could conceivably create a balloon zone off of any coastline with a series of Balloons tethered to barges of some kind. The main problem assuming cost was not an issue, would be the political ramifications of a plane hitting one of the tethers. With Internet demand on the rise, 4g’s limited range, and the high cost of laying wires to the rural home, I would not be surprised to see a test network someplace in the near future.